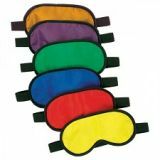 Set of 6 premium rainbow coloured blindfolds. 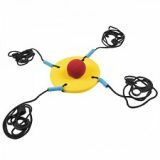 Great for initiative group work (blind leads) or for sensory work with elementary grades. Silk taffeta construction with an adjustable elastic strap. 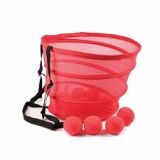 Blob tag or a blind walk, this item is perfect for it! 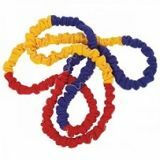 A group stretch band with promotes cooperation, interaction, and activity. Made of flexible medical tubing, inside a soft fleece outer casing. 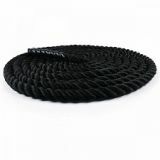 12' length and stretchable. 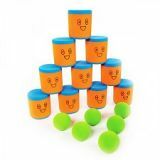 A great game to develop balance and motor skills. Wood construction. 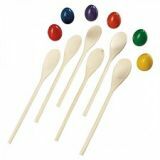 Set includes 6 assorted painted eggs and 6 unpainted spoons. A creative spin on the classic spoon and egg race game! Made of High Density foam. 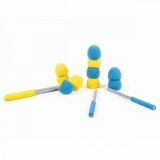 Set includes 10 eggs (2 colours) and 2 pairs of chopsticks. Retails packaged in a plastic egg carton. 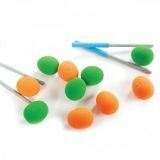 Challenge and develop fine motor skills by using chopsticks to stack irregular egg pieces. A great quiet team building activity, or perfect for indoor recess! Fun for an entire classroom of kids. 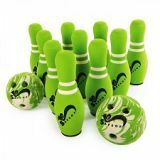 High quality construction with handles extending 2/3rds the length of the head to prevent accidental breakage. 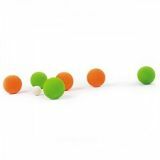 The broomball set is polyurethane coated for durability on various surfaces. 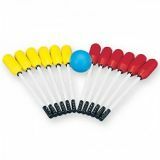 Set contains 6 yellow sticks, 6 red sticks and 1 blue nerf style polo ball.